With the launch of the infantry assault the Canadian artillery shifted to a creeping barrage. It had 40 separate lifts scheduled. At Zero Hour it concentrated on the German front line; at plus three minutes the barrage lifted from the German front line to the support line; at plus eight minutes it moved to the Black Line, the main German defences. The troops were to arrive at the summit directly behind the last lift, accompanied through the German defences by the destructive power of the artillery. On the right, the 1st Canadian Division had the longest distance to cover, about four kilometres up a gradual slope to Farbus Wood. Next, 2nd Division had the same distance to advance, their objective being the summit above the village of Vimy. La Folie Wood, after a two-kilometre advance, was the objective of the 3rd Canadian Division. The Division had to fight its way up a steepening slope and through a complex of German strongpoints to get there. On the far left of the Canadian attack, with Hill 145 on the right and ‘The Pimple’ on the left, the steepest slope was the 4th Division’s front. Hill 145 was to be captured immediately to prevent enfilade fire on the left flank of the 3rd Division. The Pimple was to be assaulted on day two of the attack by the 10th Canadian Infantry Brigade. The 4th Division had the shortest distance to cover, less than a kilometre, but faced the steepest slope, worst terrain and the strongest defences on the entire ridge. On the 1st Division front the leading platoons of the 2nd Brigade had crept into no man’s land before Zero Hour. The success of the 1st Division attacks is largely attributable to this decision and the valour of the individual infantrymen who crept into no man’s land early. The attack was supported by the explosion of two large mines under the trenches of the defending Bavarian Infantry Regiment. “Before the stuff had stopped falling, we had to man the lip of the crater that was caused,” remembered George Alliston of the 7th (British Columbia) Battalion. On the far right of the Canadian assault, the southernmost unit was the 13th Battalion. One of its members, Private Roy Henley, was the youngest participant in the attack. In 1915 he lied about his age, claiming to have been born in 1898 rather than 1901, and enlisted. At Vimy Ridge he was barely 16. Interviewed in his 80s, he attributed his courage to “the rum jar … You could go and lick your weight in wildcats after that!” With a bullet hole in his canteen, two in his kilt, and a sock torn by a ricochet, he was eventually hit by shrapnel, ending up at the neighbouring 51st Highland Division (British) casualty clearing station. By the time this boy soldier was receiving medical attention, his comrades were at their final objectives and staring over Vimy Ridge into the Douai Plain with the slag heaps of Lens on the horizon. In the 25th Battalion, on the 2nd Division front, the crucial moment for Frank MacGregor came with the order to fix bayonets. “The locking ring on a bayonet is a little loose. When the order to fix bayonets went along the line, you’d think there were a thousand bees humming. The trembling. Waiting.” Captain Claude Williams of the 6th Brigade Machine Gun Company and formerly a medical student from Hamilton, Ontario later told Pierre Berton that everyone’s highest priority was to maintain the synchronization with the barrage. “The orders were that in no circumstances was anybody to stop to do anything for the wounded — to help them, to carry them out, doing anything — it would break up the line.” For a former medical student, the order to not stop to help the wounded must have been heartrending. At 0645 hours the 21st and 25th Battalions passed through the first wave of attackers into Les Tilleuls on their way to the Red Line northeast of the town. Thirty minutes later they were digging in on their objective. The quick leap forward had cost the two battalions 468 casualties. The third wave of attackers then entered the fray. The 31st Battalion led the attack on Thelus and on to the Blue Line. The unit war diary attests to the effectiveness of the Canadian guns: “Buildings were demolished, trenches obliterated and wire smashed to atoms. There was hardly an inch of ground that did not bear witness to the tremendous effect of our guns.” By 1020 hours, less than five hours after Zero Hour, they were digging in on the Blue Line, and well on their way to the crest of the ridge. At 1415 hours elements of the 27th and 29th Battalions fired three white rockets, indicating that they had successfully attained their objective: the Brown Line running from the summit near the village of Vimy to Farbus. By mid-afternoon units of both the 1st and 2nd Canadian Infantry Divisions were looking northeast over the Douai Plain, a view the Allies had been denied for almost three years. The only aspect of the assault on the 2nd Division front that could be deemed a total failure was the effort to introduce armoured vehicles or tanks. This failed miserably. The 2nd Division assault was supported by eight Mark I tanks of the British Heavy Branch Machine Gun Corps. The tanks were armed with five machine guns and carried 30,000 rounds of ammunition. A variety of roles were foreseen for the tanks. They were to provide mobile firepower against dugouts and resistance nests: they were to provide some cover for the advancing infantrymen; and they were intended to crush barbed wire entanglements and hasten the advance of the infantry. They proved, in practical terms, underwhelming. On foot Captain Claude Williams, commanding officer of 6th Brigade Machine Gun Company, advanced across no man’s land faster than the tanks. “The tanks were mired,” sniper L. R. Fennell, 27th (Winnipeg) Battalion, told CBC Radio years later. “They had tent posts and everything else wired to their racks, but [the tracks] were just turning around through the mud and the tanks weren’t making any headway.” Three of them were subsequently destroyed by German artillery fire. Ultimately, none of the new vehicles even made it across no man’s land. On the 3rd Division front Private Harold Barker, a scout with the Royal Canadian Regiment, learned that being on schedule meant keeping up with the barrage but not getting ahead of it. “When we were going over the rehersal [sic] tapes at Bruay in the rear, we had to wait so long for the barrage to lift, but I didn’t think anything about that. I kept on going. I was too fast.” Caught in the Canadian barrage, he was wounded by shrapnel in the mouth, chest, back and leg and knocked out of the rest of the day’s action. Blind saps running forward from the Grange Subway — a tunnel system approximately 800 metres in length that had connected the reserve lines to the front line — were blown and Canadian troops had direct access to the Duffield and Durrand craters in no man’s land. The 3rd Division advanced so fast that the desultory German artillery fire fell largely behind the advancing Canadians and caused few casualties amongst the assault troops. The biggest problem that the 3rd Division encountered was Hill 145. The promontory was actually on the 4th Division front, but immediately adjacent to the 3rd Division’s left flank. Throughout the morning, positions on the hill directed artillery and mortar fire on the 3rd Division’s advance while enfilade fire from machine guns swept through the ranks. 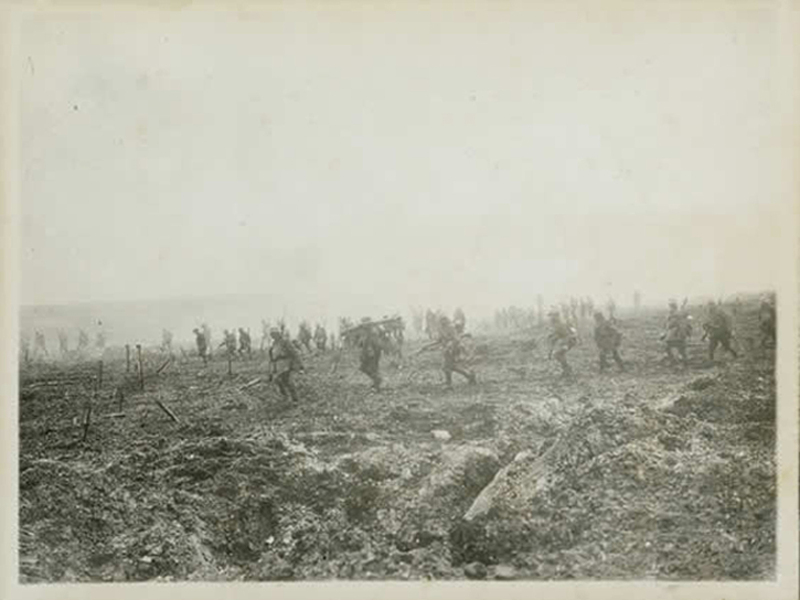 Despite the heavy casualties, the 3rd Division fought itself toward the summit of Vimy Ridge throughout the morning. Speed moving through the kill zone and synchronization with the creeping barrage were the key elements of the 3rd Division’s rapid success, and by the end of the afternoon its leading elements had reached their objectives and joined their comrades in the 1st and 2nd Divisions along the crest of the ridge. For the first three divisions of the Canadian Corps the attack on Vimy Ridge came off like clockwork. Casualties were well below predicted numbers and the advance went much like it had over the tapes on the practice fields in the weeks before the attack. Along the front, the Canadians attained their objectives on the 1st, 2nd and 3rd Division fronts.